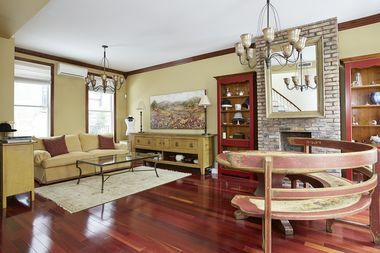 This townhouse at 16 Sylvan Terrace in Washington Heights is listed by Stribling at $1.625 million. MANHATTAN — Upper Manhattan’s real estate market is super hot — and is running against the grain of what’s happening in other parts of the island. Upper Manhattan — which spans from Harlem and East Harlem to Inwood and Washington Heights — is still considered relatively affordable compared to its southern neighbors. Median prices are nearly half of what they are in the rest of the borough, which is likely why sales are so brisk, according to real estate experts, although prices are on the upswing. In Upper Manhattan, the median price for contracts recorded in the first quarter hit $680,000, up 21 percent from the year before, according to a report released Tuesday by Stribling looking at sales during the first quarter of 2017. The median co-op price was $525,000, up 32 percent from a year ago. Nearly 60 percent of listings in Upper Manhattan went into contract in under 59 days — or less than two months — according to the report. East Harlem co-ops lead the way with 23 days on the market, while further north in Inwood some co-ops and condos went into contract after 120 days, according to a report released Tuesday from Douglas Elliman. “Northern Manhattan as a market is moving fast. It’s benefiting from the search for affordability,” said Jonathan Miller, who wrote the Elliman report. “If you look at the co-op and condo market, the median is roughly half of what it is for the entire island. “In many ways, Northern Manhattan is mirroring what’s happening nationally with rising sales, not enough inventory and a fast-moving market,” he continued. The rest of Manhattan saw those trends two years ago, he added. Now, the competition for real estate in Uptown stands in stark contrast to what’s happening to the south — where the median was $1.22 million, Stribling found — and it’s running on an entirely different track than Manhattan’s luxury market. In the segment of the market where homes are priced above $10 million, 53 percent of homes took more than 180 days to enter contract, or at least six months, according to Stribling, which noted that high-end buyers are seeing discounts and spending with caution. They’re biding their time for that “special” feature and not feeling the urgency taking over Uptown, said Garrett Derderian, Stribling's director of data and reporting. Gretchen deChellis, principal broker for ROW Real Estate, which works with residential and commercial space in Upper Manhattan and The Bronx, said she’s also noticing renters wanting to purchase in the area. “They realize that — it being the last affordable part in the borough of Manhattan — the opportunity is now, if they can do it,” deChellis said. But long-term residents and housing advocates have serious concerns that as more developers and buyers priced out of other areas have Upper Manhattan on their radar, the existing community — particularly those in rent-stabilized housing — will be squeezed out. And there has already been an uptick in evictions, many say. Real estate experts have been feeling bullish about the area, especially as Whole Foods gets ready to open on West 125th Street and Lenox Avenue and the George Washington Bridge Bus Terminal on 178th Street and Broadway is nearing completion after major delays. RoseAnn Hermann, licensed real estate salesperson for the Team Hermann at Halstead Property in Washington Heights and Inwood, said the neighborhood is seen as “unique and desirable" with places like the Dyckman Farmhouse, the Inwood Film Festival and the park areas. She added that the marketplace is very "smart" now. In other parts of Manhattan, apartments are lingering longer and discounts are becoming more common because sellers have been pricing too high, Miller said.